If you are a fan of the Downton Abbey lifestyle, a holiday at The Sherriffs with family or friends could be the perfect party house. 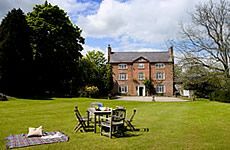 The Sherriffs holiday let is an English Tourist Board 4 star large Grade II listed Queen Anne House offering luxury accommodation in a beautiful isolated setting on the Whittern Estate,Lyonshall, Herefordshire. The accommodation comprises three large reception rooms with a beautiful dining room, drawing room and elegant sitting room. It also boasts a large family kitchen. 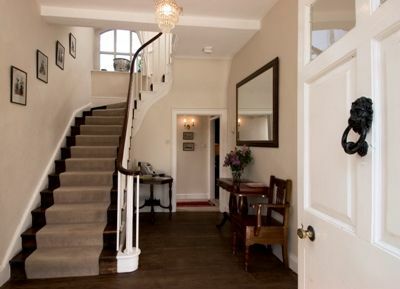 Upstairs there are 8 large bedrooms with 6 bathrooms (4 en-suite). Sleeps 18. Perfect place for a large group to stay with plenty of indoor & outdoor space. The house was well equipped, comfortable, warm and homely. The house is amazing with good facilities and there are plenty of things to do locally. It can be a bit hard to find, especially in the dark and it being so remote is it's only downside as you can't walk to any restaurants or pubs. But if you want a week away from civilisation to spend having a laugh with good friends then this place is perfect. The staff are also very good and we were left a welcome basket with food that was well received by our group! A great place for a large family get together. We celebrated my sisters 60 birthday in style. Lots of lovely grounds for the children to play were a real bonus. A fabulous venue for family festivities. As a group of 17, ages ranging from 11 to 79, and three dogs (! ), we had looked a long time for a suitable venue in which to celebrate a number of milestone birthdays. The Sherriffs proved to be perfect and Charlotte and the team at White Heron Properties could not have been more helpful from the moment we made the booking until the very end of our stay. The house had the 'wow factor' from the moment we approached the door and the interior lived up to expectation too. Rooms were spacious and beautifully furnished in keeping with history of the property. Most bedrooms were ensuite while two further rooms had washbasins - so no long queues for bathrooms! There was easily enough room for all of us to sit together comfortably in the lounge and, importantly, around the table in the dining room. The open fire with a ready supply of wood kept us cosy - although it is fair to say that the central heating was able to do that more than adequately. The large kitchen was well equipped. The enormous garden, table tennis room, supply of board games, satellite TV, WiFi and the quirky layout of the house provided endless amusement for the younger members of our party. The location of the house is great for walking or exploring the towns and villages straddling the English-Welsh border. If you are looking for the uniform polished marble and glass of a boutique appartment, the The Sherriffs may not be for you. This is a genuinely historic house with sloping floors, creaky floorboards, distorted panes of glass and it oozes the character which is to be expected in a period property and which, to our minds, made our stay at The Sherriffs all the more memorable. Lovely, spacious, quirky house and excellent customer service. Absolutely perfect for our needs. We'll be back! We booked The SHERRIFFS for a hen weekend and it had ample space for people to be comfortable and to have large meals around the table which sits 18 people. Lots of glasses and plates to use too. We love having the fire in the lounge! Charlotte was absolutely delightful and made check in and check out very easy. We also received a beautiful hamper with local goodies such as cheese and marmalade which was such a nice touch. This may just be the bed I slept in (middle floor with the blue shower room), but the mattress was very soft which personally didn’t suit me very well. But that could be personable preference! All the rooms were very clean with nice sheets and towels! The location was great for us because we stayed in the house and there’s land where you can go for lovely walks, we also did an activity at oaker wood leisure which was great. We didn’t venture into town, so could comments on other things to do, but it didn’t feel there was much going on outside of what we did as it’s fairly isolated/not walkable to many places. Absolutely loved this place and would definitely book again! 11 members of our family stayed at the Sherriffs, travelling from Aberdeen, West Wales and Hampshire. Everyone was very impressed with how grand the house was and it was so convenient having lots of bedrooms and bathrooms. The house was warm and there was enough room for everyone to sit comfortably in the sitting room, and around the huge table in the dining room. The kitchen was well-equipped with plenty of crockery and cutlery and although we didn't do much cooking there seemed to be enough saucepans. The rural situation was perfect and much appreciated by our dog. The welcome hamper on arrival was much appreciated by the humans. A burst main water pipe at midnight on Saturday caused us some problems, but the plumber arrived by 9.30 on the Sunday morning and effected a temporary repair which was the most we could have expected. I would definitely recommend the Sherriffs for a large group who are looking for somewhere rural to stay. 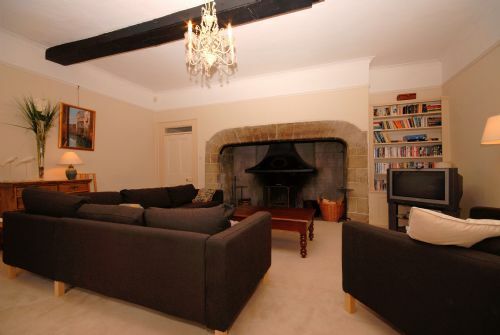 A lovely, fascinating old house with lots of interesting features, perfect for a family weekend. Very roomy bedrooms and bathrooms, though people found one or two beds uncomfortable. The dining room was ideal for a big family meal, and the lounge with its massive fireplace was great for evenings together. The kitchen was well equipped; we enjoyed a meal provided by outside caterers. I felt the fridge would have been rather small if we had been staying any longer and had been cooking more meals for ourselves. The lawn and gardens were great for games of hide and seek, as was the inside of the house. Our family party for an 80th Birthday was a happy event enhanced by the lovely setting of the Sherriffs. The house and garden provide comfort, privacy and a relaxed charm that was much enjoyed by all our guests. Its setting in the midst of beautiful countryside provided great walks as well as interesting visits to Hay on Wye, Old Radnor and Kington. Highly recommended! I thought the house was just the right size me and my family, they just loved it. The grounds were exciting, great lawn for games and the surrounding wood full of adventure for my younger grandchildren. I was very disappointed in the large amount of rubbish at the back of the house, all the bins were full with some rubbish overflowing in that area. Danger of rats etc came to mind. The kitchen was great, however there appeared to be no tray/rack combination which would allow the grilling of food and no large drinking glasses. Other than that the house was enjoyed by every member of my lovely family. We had a wonderful weekend away with a large group of friends. The welcome pack was a nice surprise on arrival! The house was lovely and spacious - everyone could sit together in the same room and you aren't all piled on top of each other. The garden has a great lawn for sunbathing and kicking a ball around. We'd definitely go back again. We had a fantastic weekend at The Sherriffs for a reunion. With families travelling from all over, the location was perfect - nobody had to travel too far. The kitchen, living room and dining room were a good size for everyone, although we spent most of the time outside enjoying the sunshine and the lovely grounds (deckchairs and croquet were well used). The beautiful welcome basket was much appreciated - especially the cassis, which makes a lovely Kir Royale. All in all a great place and we’re already planning a return visit. We spent a long weekend in the property during May and enjoyed being in a very beautiful part of the world. The period house is clearly an expensive and large house to upkeep so the state of the house means that it has become tired; bathrooms and showers were starting to lose tiles, and the water pressure in the bathrooms is just about ok. The kitchen facilities are adequate and satisfactory but no more (for example we couldn't find any scissors). We were woken during the night by rainfall as the guttering outside our bedroom was leaking. There is also no drying facilities for clothing - beyond a tumble dryer - so as we were there on a wet weekend - all our coats were dangling all over the house trying to dry. It is a lovely house - with great bones - but quite a basic level of comfort - which one would not expect at the price charged. Dear Kate, I am sorry your stay with us did not meet with your expectations. When I met your guests they seemed very pleased with the house. The house, I agree is a little tired but we have very recently been awarded another 4* from our Quality in Tourism inspection with a 80% overall rating. The kitchen is stocked with everything we think guests will need, I did check and there are scissors in the kitchen so I'm not sure where they were hiding. Had you contacted me during your stay I would have supplied you with some more. I am sorry the rain woke you in the night - during your stay we did have a terrific amount of rainfall so it really just overwhelmed and must have broken the guttering as it was not like this before you came. We are about to have a complete new boiler system put in during the summer, so hopefully this will make the difference with the water pressure. You mention drying facilities, had you contacted me I could have supplied you with a clothes airer or even got a clothes line put up inside for you, following your comments I have put a clothes airer in the house. For your stay with us you paid £68 per person per night, the price, however, is based on an occupancy of 18 so as you were a smaller group it did work out to be slightly more than the usual £41 per person per night which we feel for a Grade ll listed Queen Anne mansion is very good value. Our 5* gold property would be double that. Above everything we are really disappointed that you gave us such a low rating for our service and our cleanliness - Charlotte (the property manager) is conscientious beyond belief and is always on hand should she be required at the weekend and the cleaners were thrilled to get 100% satisfaction in the recent Quality in Tourism report. We take on board your comments and will do what we can to remedy - but as you point out for such a large and historic house, we have a constant updating programme and we keep on going with it. Thank you for your feed back. A perfect place for a large group wth first class facilities. This is the second time our group of 16 has stayed at the Sherriffs. We booked immediately after our first stay and we're just as impressed second time round. Spacious rooms, a wonderful garden, a brilliant location. Everything for a special occasion, in this case a friend's 60th. 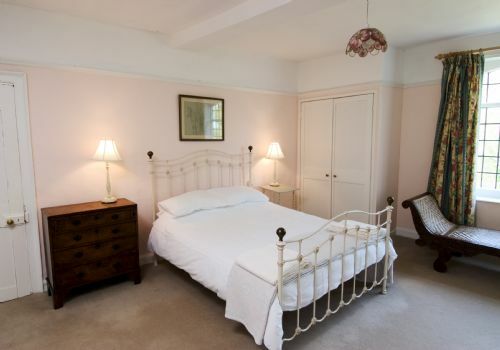 Special mention for the excellent bedrooms, gracious dining room and well stocked kitchen. We stayed here for 3 nights with a group of 12 adults, 2 babies, a toddler and a dog. The layout of the accommodation was perfect for our group with a couple of rooms in the back extension, meaning quiet for the babies, and everyone having their own, large room. The house is absolutely stunning and the large living room gave us a lovely space to relax in during the evenings and we ate our meals at the huge kitchen table. It's a very old and large property so has single glazing and some slopey floors etc. but it's been maintained beautifully and was spotless when we arrived. The kitchen was fully stocked with all the utensils and crockery we needed in our stay, and the welcome basket with a few essentials was very much appreciated. During the weekend, we enjoyed a long walk along the Lyonshall Medieval Trail and an Easter Egg Hunt around the garden. We also played lots of table tennis and boules in the garden. Overall, this was a fantastic stay. Charlotte, the property manager, was very helpful and friendly, and we would recommend this to any large group of friends or family looking for a remote, country getaway for a very reasonable price. We gathered again at the Sherriffs with the satellite Field Cottage sleeping some of the family too. We were warm, comfortable, able to spread out if we needed. The enormous kitchen and sitting rooms allowed us all to gather informally and we seated 22 around the big table in the dining room. The bedrooms are lovely and comfortable. The kitchen is really well equipped and great for the many people producing different parts of the feast. We cycled, ran, played games, played (toddler), walked over Hergest ridge, drank coffee in Prmbridge’s lovely cafe, read ...The welcome and service was excellent. We will return next year and repeat it again I’m sure..
We stayed at the Sherriffs for a 40th birthday party for a week. It's a lovely house, very warm, with a great kitchen and lovely dining room that easily sat the whole party. Nice bedrooms, pretty grounds. A very friendly house, and it was suitable for both grown-ups and small children. Nice welcome basket. A random point, but there is a lovely pantry - so many of these large properties don't have sufficient storage space for food and drink. Charlotte from White Heron Properties couldn't have been more helpful and kind. She really went above and beyond in accommodating our requests for the week. A group of 13 adults stayed at the Sherrifs for our annual reunion for a weekend in January. Everyone loved the house, it is a great size and was in the most part, well equipped (could have done with a few more pint glasses). All the bedrooms were of a generous size. It was great that both the lounge and the dining room had plenty of room to seat us all and even had a large table in the kitchen that again could seat us all. The only slight downside was that when we arrived on the Friday night the house was very cold but we had no issues once it had warmed up. The kitchen could have done with a few more pint glasses and a shame that some of the showers were hard to regulate. We all loved staying at The Sherrifs - it was perfect for the needs of our extended family: warm, spacious and comfortable:ideal for Christmas but I imagine very nice at anytime of year. 15 friends (including 3 little ones) met for four days to celebrate my 70th birthday and we were all delighted with Sherriffs. Despite it being a cold November weekend, the house, including all the bedrooms, was really warm from the moment we walked in. The communal rooms are all a good size, welcoming and very pleasantly furnished and the kitchen well equipped. The grounds are lovely and we had some good walks in the area with my dogs. Many thanks to Charlotte, the manager, for providing us with excellent information in advance and looking after us on arrival. I wouldn't hesitate to recommend Sherriffs as a great home (as opposed to just a rented house) for a gathering of friends and family. A large house with character with an easy going lived in appeal. The feature working fireplace is spectacular and the endless supply of seasoned wood was a real benefit. There is a good range of bedrooms, en-suites and bathrooms situated on the first and second floors. The peace and quiet of the surrounding countryside all added to the memorable experience. Had a fantastic weekend celebrating my parent's wedding anniversry. The property was ideal for our needs as we could relax and spend time catching up in the spacious surroundings. Perfect house for four families annual wend away. We comprised of adults to young kids and pleased all. Social areas big enough for everyone in one room which was great. Outside areas a real bonus. Would not hesitate to recommend. I stayed at The Sherriffs with 14 friends over the August Bank holiday weekend found it to be the ideal house for a party or large gathering. It's huge and well appointed: there's plenty of seating in the kitchen, dining room and main lounge space, plus lots of bedrooms and plenty of bathrooms. We were self-catering all weekend and found everything we needed (although it could perhaps do with a second fridge for drinks) to prepare and eat food as a group, plus multiple BBQs for cooking alfresco. Location-wise it's great. It's even more secluded than we had imagined, which is perfect for a large group wanting to play music (and SingStar) until the wee hours. The front lawn is gorgeous, and I'm only disappointed we didn't have longer to make use of it. Customer service was spot-on as well. Our Tesco delivery arrived a good couple of hours earlier than scheduled, but it was received and all perishables safely stored in the fridge for us, which was much appreciated. In the surrounding area we enjoyed an afternoon of canoeing from Hay-on-Way and a lovely lunch (followed by a beautiful walk) at the Riverside pub in Aymestrey. All in all, I'd definitely recommend staying at The Sherriffs. 16 family members stayed at Sherriffs for my Mum's 70th. It was ideal for our needs - very well equipped and clean. The outside areas and deck chairs provided a great setting for a BBQ and the paths mowed around the fields were a great idea for family walks. We appreciated our dog being allowed to visit, as did she. I would definitely recommend Sherriffs for a family party. Thanks to Sarah and Jo. We enjoyed the space and style of house. Kitchen very well-equipped( except need extra tin-opener!). Showers a bit variable in temperature. Some bathrooms not ensuite. Gardens lovely and appreciated the shade in the hot weather. The bird-song at breakfast time was lovely. House a bit isolated--a long narrow drive and not really within walking distance of pubs, shops etc. Great house for a reunion . A bit on the expensive side compared to previous similar properties. This wonderfully charming house set in the middle of nowhere was perfect for our school reunion. The house is huge, the layout is wonderful and the gardens are fantastic. We had the most enjoyable time and wouldn't hesitate in staying again. A excellent property in a extremly secluded location. The house and garden are beautiful and set within the middle of the countryside, which provides a extremly secluded location to completly switch off. The several bedrooms are all luxuroious and the entertaining space is perfect for large groups. The property managers were extremly helpful providing suggestions of varies suppliers to make the stay one to remember. I cannot speak too highly of this place. A great balance between retaining the house's original features and providing modern comforts. All the bedrooms were very spacious,as was the kitchen and dining room. Of particular note were the beatiful grounds and having two living rooms. Plenty of parking space. Ideal for trips to Ludlow, Hay and Hereford. Tremendous value,too. Very highly recommended. We will return without a shadow of a doubt! We came here for my hen party and it was amazing!! Best weekend of my life. Perfect house. It was a complete surprise and I loved every moment of it! Come here! The Sherriffs is a really lovely comfortable, well equipped and and visitor friendly house in the most wonderful location. Our family all thoroughly enjoyed every minute of our stay - it far exceeded expectations. We would all love to return at some point. Highlights are clearly the Countryside, spacious grassed front garden with amble parking & the large kitchen. Our enjoyment was somewhat watered down by the poor condition of the Springs in some mattress's & Lounge Settee's making them very uncomfortable to lay on/sit in. We have taken the comments on this review on board and are replacing the sofas and the mattresses where we concur with the guests. We pride ourselves on great service and accommodation and we are sorry that the expectations, on this occasion were not met. We booked The Sherriffs for a party weekend for 16 people. The property was fantastic, rooms were spacious and comfortable and the facilities were as described. The info and communication was excellent and we found the property without an issue. The location is good as there are no neighbours so you arent worried about waking anyone up but you can still explore the local areas easily enough. The grounds around the property are amazing and i wish we had booked in summer so we could have enjoyed them more. We hold an annual event which before we found The Sherriffs had been in different locations all over the country. Since finding The Sherriffs we've never looked elsewhere. It is the perfect place for adults and children alike. We've always stayed in the winter and been beautifully warm, enjoying log fires, frosty walks, comfortable beds, plenty of hot water, soft big white towels and loved being able to make as much noise as we like knowing we are not disturbing anyone. I imagine staying in the summer would be even more glorious with the lovely gardens and enjoying being outside more. White Heron Properties are organised and efficient and helpful. Supermarket and wine delivery services all deliver quite happily. And all the bedrooms are of similar standard so there are no fights that 'your bedrooms better than mine'. We all love The Sherriffs and are already looking forward to coming back next year. Thanks for having us. This is the second time we've visited so it must be good! A large rambling country house which in our case was great for kids, and (since some bedrooms are in their own 'wing') great for adults who don't want to be disturbed by the kids. The bedrooms are large and very comfortable, with several en suite bathrooms, a good selection of cupboards and drawers and beautiful views over the countryside. There are 2 living rooms: the main one has a fire, with firewood provided. There's also a large formal dining room which gives a sense of occasion. Unlike some other properties we've been to, the kitchen is well-stocked with an array of pots, pans, casseroles and other equipment if you want to cook something ambitious for large numbers. Though we didn't make much use of the garden in the winter, previously (in the summer) we used the magnificent lawn for tea parties. Although the house is on its own, there are villages nearby with shops and Ludlow and Hay on Wye are both 30 mins away. The setting is ideal for a freeform holiday involving staying in, going for walks, and sight-seeing further afield. With so many of us it can be difficult to find a house that suits everyone's needs (as a group we have an age range that covers 2-70yrs)- this property is a great house that suited everyone; in a superb location with ample space for all of us. A fabulous property for a weekend get together with friends/family- and situated perfectly, so no worry of disturbing anyone else. We will definitely be back! Fantastic House, brilliantly equipped with loads of space. It has everything you might need. Perfect for a big group of friends to get together for a Reunion. We had a fabulous weekend staying at Sherriffs. The house was perfect for our needs. Plenty of space, a table large enough for us all to have dinner around. The added bonus of a huge table also in the kitchen where we could all meet for breakfast. The sofas in the lounge were so comfortable and, again, plenty of seating for us all. We would definitely recommend the house for a large gathering - perfect.